KANSAS CITY, Kan.— Kevin Harvick crashed the Chase for the NASCAR Sprint Cup party. Kyle Busch simply crashed—at a track that continues to bedevil him. And with a bizarre power failure in the last two laps, Johnson failed to cash in decisively on Matt Kenseth’s skittishness with the new tire combination Goodyear brought to Sunday’s Hollywood Casino 400 at Kansas Speedway. The fourth race in the Chase ended as it began, with Harvick out front. The driver of the No. 29 Richard Childress Racing Chevrolet crossed the finish line more than a football field ahead of runner-up Kurt Busch, with Jeff Gordon trailing Busch in third. Joey Logano, Carl Edwards and Johnson ran third through sixth, respectively, allowing Johnson to trim Kenseth’s advantage in the championship standings from eight to three points. 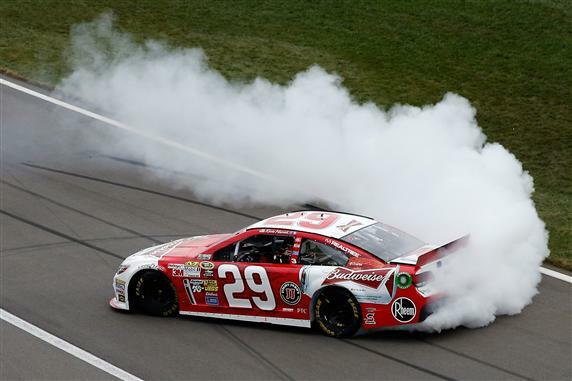 The victory was Harvick’s third of the season, his first at Kansas and the 22nd of his career. With the win, Harvick moved into third place in the standings, 25 points behind Kenseth. Kyle Busch, who entered the race third in the Chase and 12 points behind Kenseth, scored his third straight DNF at Kansas after crashing out in 34th place and dropping to fifth in points, 35 out of the lead. “To sit on the pole and win the race, obviously, is a great weekend,” Harvick said. “Controlling our own destiny by doing that, putting ourselves closer to where we need to be with the championship race… so we’ll just keep having fun and doing what we’re doing. Harvick’s car out front in clean air was radically different than the same car in traffic. After Harvick got shuffled back in traffic by an inopportune debris caution on Lap 87, crew chief Gil Martin opted to keep him out on old tires under caution for a wreck involving Justin Allgaier and Ryan Newman on Lap 146. The move paid off, and Harvick was able to stay in position near the front of the field for the balance of the race. Johnson likewise had a strong car but couldn’t get the track position he need to make a run at the win. He felt a strong vibration in his car with two laps left, but the car regained power on the backstretch of the final lap and Johnson held sixth at the finish. Kyle Busch’s championship hopes suffered most, but no driver seemed immune from adversity. Gordon, Johnson, Busch and Harvick all lost positions—and in some cases, laps—when cautions interrupted cycles of green-flag pit stops. But the record 15 cautions for a record 71 laps—one because of a grass fire on the bank outside Turn 1 that shrouded the track in smoke–provided ample opportunity for wave-arounds and restarts that allowed drivers to make up lost ground. With a loose handling condition that plagued him throughout the race, Kenseth salvaged an 11th-place run that kept him at the top of the standings—barely. Throughout the weekend, Kenseth expressed uneasiness with a lack of grip he felt with the dual-tread right-side tire Goodyear provided for the race. Nevertheless, with a manic drive through traffic during the final 19-lap green-flag run, Kenseth gained four positions after the final restart to retain his points lead. 1. (1) Kevin Harvick, Chevrolet, 267, $364636. 2. (19) Kurt Busch, Chevrolet, 267, $229810. 3. (14) Jeff Gordon, Chevrolet, 267, $216776. 4. (5) Joey Logano, Ford, 267, $176473. 5. (9) Carl Edwards, Ford, 267, $164765. 6. (3) Jimmie Johnson, Chevrolet, 267, $164376. 7. (8) Paul Menard, Chevrolet, 267, $146456. 8. (6) Dale Earnhardt Jr., Chevrolet, 267, $126140. 9. (25) Marcos Ambrose, Ford, 267, $137154. 10. (20) Aric Almirola, Ford, 267, $145601. 11. (7) Matt Kenseth, Toyota, 267, $144096. 12. (16) Jeff Burton, Chevrolet, 267, $113355. 13. (26) Greg Biffle, Ford, 267, $117655. 14. (22) Clint Bowyer, Toyota, 267, $141613. 15. (15) Kasey Kahne, Chevrolet, 267, $116880. 16. (24) Jamie McMurray, Chevrolet, 267, $128625. 17. (4) Brad Keselowski, Ford, 267, $150871. 18. (12) Juan Pablo Montoya, Chevrolet, 267, $127394. 19. (13) Martin Truex Jr., Toyota, 267, $131555. 20. (28) AJ Allmendinger, Toyota, 267, $126138. 21. (37) Casey Mears, Ford, 267, $122238. 22. (23) Mark Martin, Chevrolet, 267, $140905. 23. (10) Denny Hamlin, Toyota, 267, $113255. 24. (34) David Gilliland, Ford, 267, $110313. 25. (41) Dave Blaney, Chevrolet, 267, $107663. 26. (36) Travis Kvapil, Toyota, 267, $112277. 27. (33) JJ Yeley, Chevrolet, 267, $94030. 28. (35) Timmy Hill #, Ford, 267, $93430. 29. (42) Tony Raines(i), Chevrolet, 267, $90230. 30. (2) Ricky Stenhouse Jr. #, Ford, 266, $140316. 31. (30) Cole Whitt(i), Toyota, 260, $93280. 32. (11) Brian Vickers(i), Toyota, Accident, 242, $97580. 33. (43) Landon Cassill(i), Chevrolet, 235, $89380. 34. (18) Kyle Busch, Toyota, Accident, 199, $134588. 35. (17) Ryan Newman, Chevrolet, 188, $123103. 36. (32) David Ragan, Ford, Accident, 168, $96755. 37. (27) David Reutimann, Toyota, 157, $88525. 38. (31) Michael McDowell, Ford, Vibration, 144, $82860. 39. (21) Justin Allgaier(i), Chevrolet, Accident, 135, $86860. 40. (38) Josh Wise(i), Ford, Vibration, 108, $74860. 41. (39) Joe Nemechek(i), Toyota, Engine, 107, $70860. 42. (40) Reed Sorenson(i), Ford, Vibration, 103, $66860. 43. (29) Danica Patrick #, Chevrolet, Accident, 0, $63360. Average Speed of Race Winner: 114.884 mph. Time of Race: 3 Hrs, 29 Mins, 10 Secs. Margin of Victory: 1.140 Seconds. Caution Flags: 15 for 71 laps. Lead Changes: 24 among 12 drivers. Lap Leaders: K. Harvick 1-44; C. Mears 45; K. Harvick 46-79; J. Johnson 80; K. Harvick 81; J. Johnson 82-86; D. Earnhardt Jr. 87-88; T. Kvapil 89; D. Earnhardt Jr. 90-91; M. Kenseth 92-112; D. Earnhardt Jr. 113; D. Ragan 114-115; D. Earnhardt Jr. 116-120; J. Logano 121-139; K. Harvick 140-144; Kyle Busch 145; K. Harvick 146-156; J. Logano 157-170; B. Keselowski 171-198; K. Harvick 199; B. Keselowski 200-223; K. Harvick 224-229; J. Yeley 230; J. Burton 231; K. Harvick 232-267. Leaders Summary (Driver, Times Lead, Laps Led): K. Harvick 8 times for 138 laps; B. Keselowski 2 times for 52 laps; J. Logano 2 times for 33 laps; M. Kenseth 1 time for 21 laps; D. Earnhardt Jr. 4 times for 10 laps; J. Johnson 2 times for 6 laps; D. Ragan 1 time for 2 laps; J. Yeley 1 time for 1 lap; J. Burton 1 time for 1 lap; C. Mears 1 time for 1 lap; Kyle Busch 1 time for 1 lap; T. Kvapil 1 time for 1 lap. Top 13 in Points: M. Kenseth – 2,183; J. Johnson – 2,180; K. Harvick – 2,158; J. Gordon – 2,151; Kyle Busch – 2,148; G. Biffle – 2,139; Kurt Busch – 2,136; D. Earnhardt Jr. – 2,129; C. Bowyer – 2,128; J. Logano – 2,124; C. Edwards – 2,123; R. Newman – 2,110; K. Kahne – 2,100.